What can I expect from the Professional Partnership Program? nLIVEn’s Professional Partnerships are designed to energise and inspire you to achieve your full potential. Unique to nLIVEn and the result of many years’ planning and experience, the program has been carefully structured to provide an optimum blend of coaching, mentoring, training and development. The program combines a proven structure with individualised components that build your capacity to understand and achieve your dreams. Professional Partnerships are targeted towards outstanding people and organisations that are ready to increase their effectiveness and satisfaction. The personalised approach of nLIVEn ensures your most important objectives are addressed, whether you are seeking measurable and tangible results or abstract and creative outcomes. 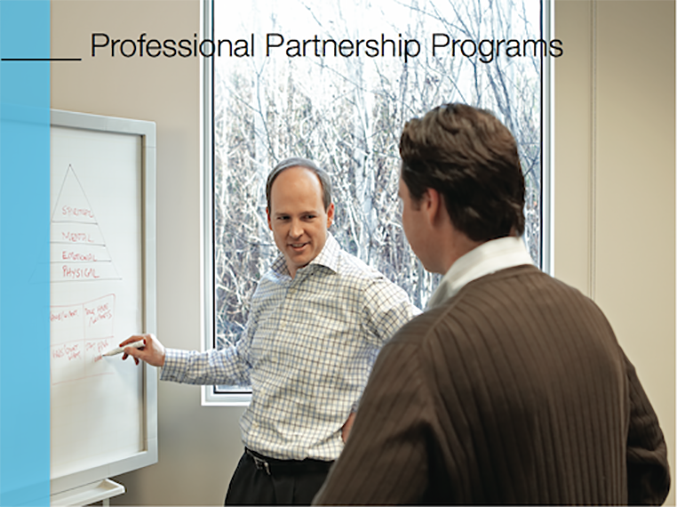 Many hundreds of participants, most of whom are referred by word-of-mouth, are testimony to the success of the Professional Partnership Program. In working within nLIVEn’s unique high-performance tools and programs, clients become champions for their own professional and personal lives; inspiring self-satisfaction, driving meaningful, abstract and creative outcomes. 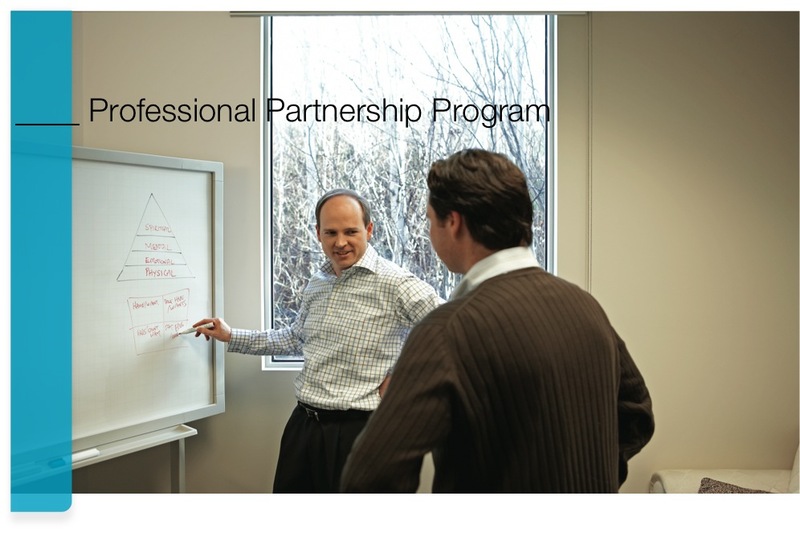 How is the Professional Partnership Program Delivered delivered? Programs are comprised of 18-27 sessions conducted over a period of twelve months. During the twelve month program, you will also have access to your Professional Partner by telephone, email and fax in addition to your scheduled sessions. There will generally be no scheduled sessions in January, July or December of each year. However, you can either purchase additional sessions during these months or bring session/s forward from the remainder of your program, by agreement based on your Professional Partner’s availability. Choose the best package for your circumstances. Process payment in full or the first instalment of a payment plan. Fill in and submit registration forms. "I just wanted to thank you for that beautiful bottle of Moet & Chandon. John and I will save that for a special occasion. It is one of our favourite champagnes that deserves thorough enjoyment. I also want to thank you from the bottom of my heart for your belief in my abilities. You have been able to get me to focus on the business in a way I was to be made believe I couldn’t do. I never thought we were worthy of any award and you have made me think otherwise. I don’t really care if I don’t win because I have a team around me that believe we can and that means so much more to me. I am so very grateful. I can’t wait to see were we go for 2014/2015 but I believe it will be as exciting and challenging as this year." "I started to work with Glenn some months ago first on one of his Leaders Edge Program. This short and tailor-made program made me realise the importance of having someone next to you to help, support, make suggestions during the development of your business. This is exactly what Glenn has done for us. I am confident we have now a clearer view of where we are going as a business and how. We plan to continue using nLIVEn services on a regular basis in the future." "I was at a point where I did not want to get up in the morning and go to work, which was strange - as it was my own successful business. I had no energy. I was feeling lost. nLIVEn’s Professional Partnership Program facilitated a lot of reflection, which got me thinking on a more fundamental and philosophical level. We worked on articulating my dreams into a vision - crystallizing what I am really passionate about. It was an evolving process where some of my original dreams were replaced with a bigger vision. Fast forward a year and I am happier, engaged with my business again and feel lucky to have my business. During the past year Glenn’s guidance was invaluable when I had a number of unexpected issues arise. Tapping into Glenn’s vast knowledge and experience guided me to learn that these issues were actually a blessing in disguise. I had tried coaching before, which didn’t work as I had no connection to the coach as I did not respect him, and felt it was just a ‘job’ to him. Glenn has a real passion and interest in coaching, which is second to none. This make him a great resource for executives and entrepreneurs. If you are open minded and know you can’t do it all alone, the brain power and ideas you can get from other people will prove invaluable. If you are not lucky enough to have such people around you and / or you are looking for an independent and objective point of view, Glenn and the team at nLIVEn would be a really valuable addition to your team. Anyone who is serious about achieving a big scary decision, taking the next step in their business / career or following their passion would benefit from engaging with nLIVEn. Expect gentleness to encourage reflection, but the kind of firmness that doesn’t allow you to cop out when things get difficult or too hard. " "Glenn has a calm determination. He is patient, objective and wise. He is a mentor." "Glenn Williams would be one man that I would have to say I admire beyond words - if I was to try and articulate my experience of Glenn Williams I would say PROFESSIONAL; DYNAMIC; WISE; ARTICULATE; AUTHENTIC; HUGE CAPACITY TO LOVE; QUALITY; LOYAL - if you are ready to take yourself to the next level and experience profound partnership on that journey look no further than Glenn - a priceless investment!" "Working with nLIVEn was a highly valuable venture for our business. Their approach was personable, constructive, and most importantly, effective. nLIVEn were able to easily understand and refine our key objectives, identify our obstacles and create strategies to assist our progress towards success. nLIVEn was resourceful and inventive in the solving of issues we had found challenging, and provided flexible and adaptable suggestions for improvement. Glenn Williams on a personal level is professional, relaxed and focused - able to seamlessley shift between providing casual advice to individual employees to demonstrating high-level, targeted methods for our business to achieve it's goals. nLIVEn allowed our business to analyse and assess our practices and choices from a new and fresh perspective. From there, we were able to collaboratively develop clear plans of actions together. Understandably, final implementation was a breeze. Thanks for a job well done." "I've had the pleasure of getting to know Glenn in 2011, but most importantly, utilizing his service as a career development coach. His unique service has brought clarity to what I want to achieve, both personally and professionally and allowed me to develop a career roadmap, highlighting the various milestones I will cross on my way to achieving these objectives. I would highly recommend Glenn to anyone wanting clarity and guidance in advancing their personal and professional aspirations." I started working with Glenn after receiving a very challenging promotion in a difficult corporate environment. The program I followed with Glenn was tailored to my specifics needs. It enabled me to develop new skills, create innovative solutions and refocus my career. I am now working with Glenn on a new business venture, which I know I would not have started without Glenn's help over the last 3 years. I highly recommend Glenn as a great mentor who challenges and advances my thinking. Most importantly Glenn has helped me achieve greater success and enjoy the journey along the way.